I've been thinking of getting a pet budgie, but we live in a studio and have pet rats. The rats are allowed 4-5 hours a day on the couch for playtime and of course the bird and the rats cannot be out together for playtime. My question is if it is wise to keep both rats and a budgie in a studio or should we wait until we move into a bigger place? I've always had my birds and rats. (Well, not always, but you know). As long as you don't have them out together, the only thing you would have to be careful about is the bird landing on the rats cage. Rats do love to nip toes. Incidentally, I'm 95% sure budgies should be kept in pairs. Yeah I know about that. Three years ago I "rescued" a rosella parakeet from a pet shop, and back then I lived in a student dorm and had a big furret cage with two pet rats. The rosella wasn't clipped and she could fly wherever she wanted and her favorite past time was annoying the girls by landing on their cage and chewing on the metal chains of their tunnel, only to fly away when they chased her. She wasn't tame but I didn't mind, from day one I let her fly loose in my room and she always went back to her cage when the lights went out and I never had any problems with her. Sadly she died of a hart attack the same month I got her. This time the budgies will need to be clipped since in summer we keep the windows open and they can also fly down the stairs and hurt themselves, or as mentioned land on the rat cage and lose a limb since these girls are faster then my previous. But since you've never had a problem and if we take the right precautions it should be ok right? Yes, I would imagine so. Truth be told, I'm not convinced the rats are even aware the parrotlets live here. They rarely sing. Lol, what kind of birdies do you have? They are smaller that parakeets, if you've never seen one in person. I'm now trying to persuade my bf to add a bird to our pet collection but he's so stubborn, saying he doesn't want to divide time between the rats and a bird. Oh well I'm still in the research stage so maybe I can convince him once I've got all the information I need. "Miniature parrot" will probably help you in their search. I haven't the slightest what they would be called in another language. They have care requirments pretty similar to lovebirds, except that you really only want to have one. Unlike lots of birds species, they actually won't bond to you if they are kept in pairs. I elected to get Coby because Emma (Emerald-Bird) went through a traumatic experience, and refused to bond with humans. Coby likewise came from an abusive situation, so he also was happier with bird-company than human company. 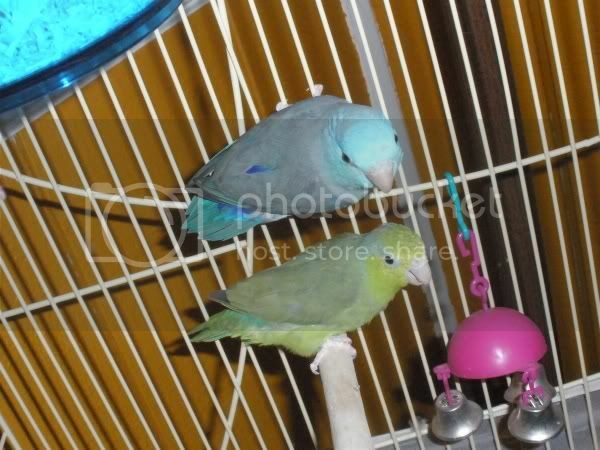 When I was younger I had a single parrotlet named Bartholomew, and he was the sweetest little creature in the word. He would sit on my shoulder and groom my hair all day long. One thing which might make them a bad choice for you though, is how small they are. They are so light that even if you clip their wings they still retain full flight. I found them under their latin name Forpus, that's how their called in Dutch. Also I found some decent breeders that sell birds that can eat by themselves, for I prefer that so much more then buying a chick that could have spent more time with its parents, only to be removed and hand fed to make it tamer. Ideally, I would like to adopt and like you, give the birds that have been mistreated or neglected a second loving home. Sadly, the only birds that are placed up for adoption are large parrots, and I neither have the time or space to take care of them. That is exactly what I'm looking for in a bird. A social bird you can interact with and that really bonds with you, yet is small in size. But sadly, if they still retain full flight even after they are clipped, then it's too much of a risk. What if it accidentally flies on the ratcage? What if it flies down the stairs and hurts itself? I suppose I know what you mean, since you live in a studio. I can always just let my birds out in my bedroom, and shut the door. Parakeets can be loving too though, and cockateils aren't that big, and they bond very nicely with humans.